Valentine's Day is just around the corner. If you are looking for something different to make this year, try these Glazed Lemon Poppy Seed Hearts. They are sweet, crispy, and delicate, with just the slightest hint of lemon, and they absolutely melt in your mouth. They are a little time-consuming, but what better way to show your love than with just a little more labor than usual? And these are well worth the extra effort. As much as I love chocolate, these make a nice little surprise of a difference. These are the fourth cookies I have made from Tish Boyle's The Good Cookie. I have to say, I am really liking this cookbook. So do something different this year from the usual chocolate. You won't go wrong with these. bring to a boil. Place the remaining 1/3 cup sugar in a small bowl and set aside. Add the lemon strips and boil them for three minutes. Remove the peels with a slotted spoon and toss with the reserved sguar until coated. Transfer them to a plate and let them dry for at least 30 minutes. Transfer them to a sieve and shake out the excess sugar. For the glaze, place all of the ingredients into a medium bowl and mix until just combined, about 30 minutes. Cover the surface with plastic wrap and leave at room temperature until ready to use. Preheat the oven to 350 deg. F. and place the racks near the center. Line two baking sheets with parchment paper. Bake the cookies for 14 t 16 minutes, until they are pale brown around the edges. Turn the pans and switch their positions halfway through. Place the baking sheets on wire racks. Glaze the cookies while they are hot. 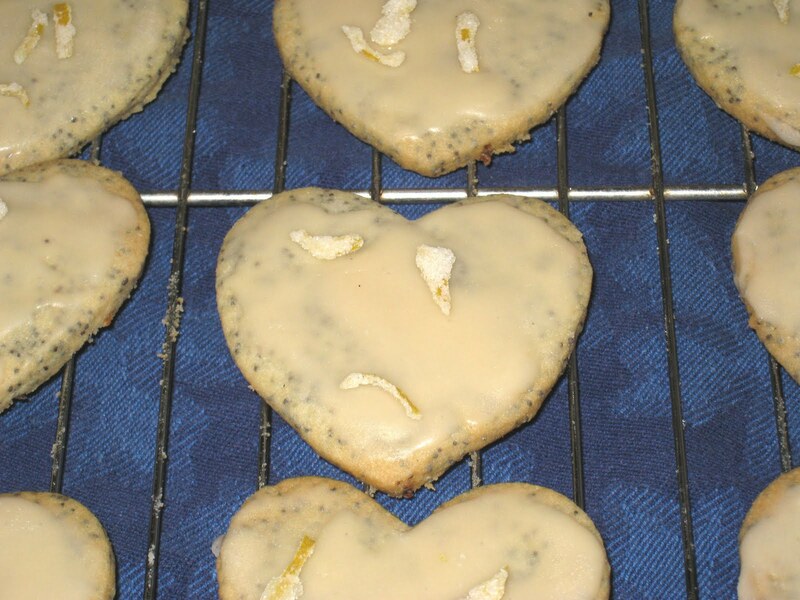 Spread a teaspoon of the glaze evenly over each cookie, and then garnish with a piece of the candied lemon peel. Transfer the cookies to the wire rack and let them cool completely. from The Good Cookie: Over 250 Delicious Recipes, from Simple to Sublime, by Tish Boyle (John Wiley & Sons, Inc., 2002).